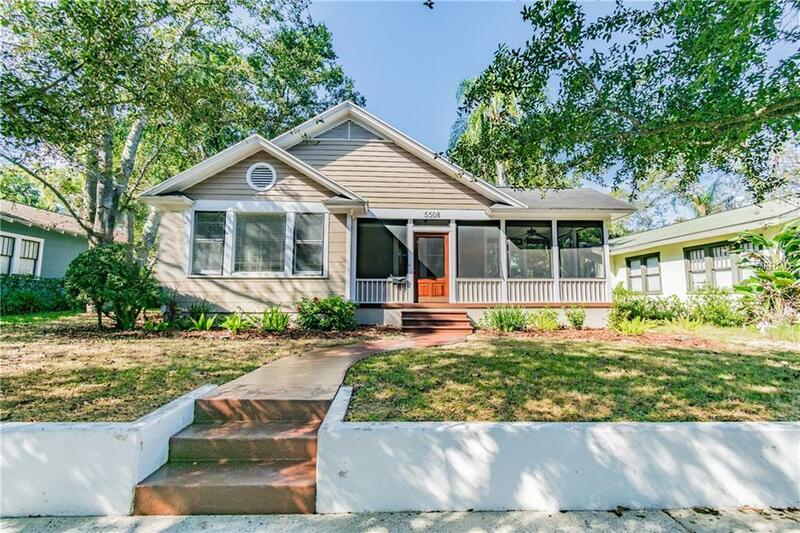 This charming Seminole Heights bungalow is a true neighborhood gem! Be greeted by a spacious front porch that leads into an open living room/dining room with original wood floors. A split floor plan offers 3 generously sized bedrooms, 2 updated bathrooms, interior washer & dryer, refreshed paint, large windows with ample natural light, crown molding throughout and custom window treatments. The kitchen allows for any buyer to add their personal touch and has 2 pantries for additional storage. Relax on the back screen porch perfect for enjoying a morning cup of java. Private electronic gate off the rear ally allows privacy and entry to your 2 car garage with attached 1/1 guest house! The shaded backyard with mature landscaping is perfect for entertaining guests and offers a private pathway to the garage apartment perfect for an AirBnB rental! *Sellers did a Pre-Listing home inspection and made repairs, giving any potential buyer peace of mind!